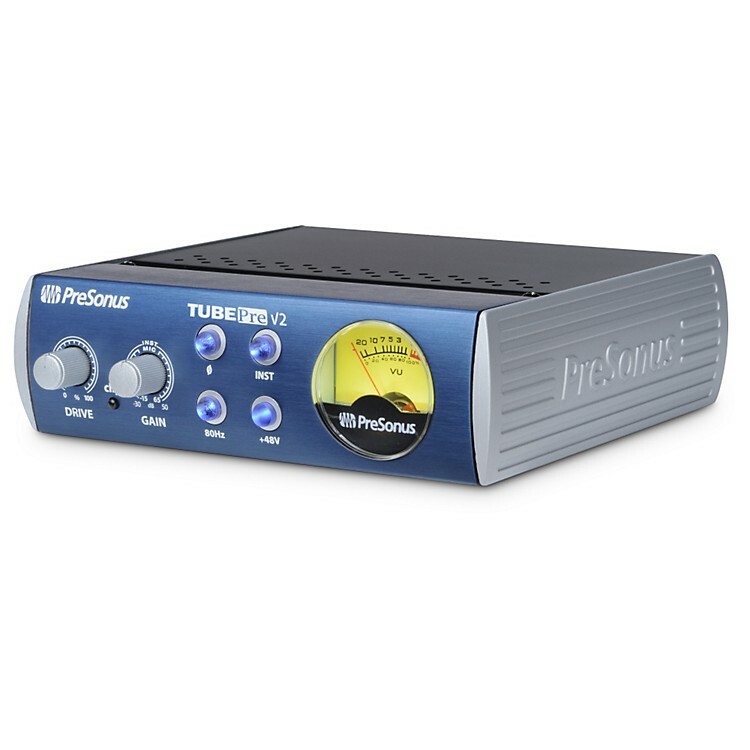 Improved quality in sound and design in the PreSonus TubePre preamp/DI box. The masters at PreSonus have been designing preamps for a long time, and they always focus on audio quality first and foremost. Now they've upgraded on their most popular single-channel preamp, the TubePre v2 is focused on improving an already high-quality sound. Like the original TubePre, the new version is a fully professional tube preamp, with a dual-servo (no capacitors) gain stage that lets you boost the program signal to smoking hot levels without significantly increasing the background noise. Discrete components and high-voltage operation offer dynamic range and detail not found in other single-channel tube preamps in its class. The TubePre v2 provides an even wider palette of sound options, and a much more focused tube saturation than the original TubePre. It has been upgraded to employ PreSonus' popular XMAX Class A solid-state preamp, which is followed in the signal path by a 12AX7 vacuum-tube stage. Twist the TubePre v2 Drive saturation control to add the "color" that only a hand-selected 12AX7 vacuum tube can deliver - from gentle warmth to total fuzz. Housed in a rugged case, the TubePre v2 rear panel sports separate unbalanced 1/4" instrument and balanced XLR mic inputs and unbalanced 1/4" and balanced XLR line outputs. Plenty of professional extras including a high-pass filter, phantom power for condenser mics, polarity reverse switch and a backlit VU meter. The TubePre v2 is more than a mic preamp, though. Thanks to its separate instrument and mic inputs, it also serves as a dynamite direct box (DI) for guitars and basses. And it's small enough to carry almost anywhere, although you also can screw-mount it to a standard rack tray. Just when you think it can™t get any better, it does. Order the improved TubePre v2 today.